A mineral water spring at Sabalan Mountain, Iran. 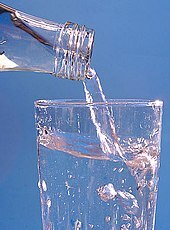 Mineral water is water from a mineral spring that contains various minerals, such as salts and sulfur compounds. Mineral water may be classified as "still" or "sparkling" (carbonated/effervescent) according to the presence or absence of added gases. Traditionally, mineral waters were used or consumed at their spring sources, often referred to as "taking the waters" or "taking the cure," at places such as spas, baths, or wells. The term spa was used for a place where the water was consumed and bathed in; bath where the water was used primarily for bathing, therapeutics, or recreation; and well where the water was to be consumed. Today, it is far more common for mineral water to be bottled at the source for distributed consumption. Travelling to the mineral water site for direct access to the water is now uncommon, and in many cases not possible because of exclusive commercial ownership rights. There are more than 4,000 brands of mineral water commercially available worldwide. The more calcium and magnesium ions that are dissolved in water, the harder it is said to be; water with few dissolved calcium and magnesium ions is described as being soft. The U.S. Food and Drug Administration classifies mineral water as water containing at least 250 parts per million total dissolved solids (TDS), originating from a geologically and physically protected underground water source. No minerals may be added to this water. In many places, however, the term "mineral water" is colloquially used to mean any bottled carbonated water or soda water, as opposed to tap water. In the European Union, bottled water may be called mineral water when it is bottled at the source and has undergone no or minimal treatment. Permitted is the removal of iron, manganese, sulfur and arsenic through decantation, filtration or treatment with ozone-enriched air, in so far as this treatment does not alter the composition of the water as regards the essential constituents which give it its properties. No additions are permitted except for carbon dioxide, which may be added, removed or re-introduced by exclusively physical methods. No disinfection treatment is permitted, nor is the addition of any bacteriostatic agents. ^ "Hard Water". USGS. 8 April 2014. Retrieved 16 May 2015. Wikimedia Commons has media related to mineral waters. Look up mineral water in Wiktionary, the free dictionary. "Mineral Waters" . New International Encyclopedia. 1905. This page was last edited on 31 January 2019, at 15:46 (UTC).